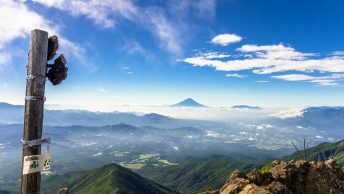 For my first excursion to Yamanashi Prefecture I singled out Mt. Daibosatsu another of the 100 Famous Mountains of Japan. 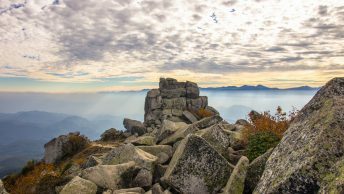 The hike is renowned for its stunning views of Mt. Fuji particularly through the winter months. As I was heavy packing all my gear I thought best to turn it into a comfortable overnight outing, through super fit hikers could foreseeably knock it over in a day. The easiest transport access to the trail head is by taking the Chuo Line to Enzan Station 塩山 and transferring to a bus service for the final leg to the Daibosatsu-toge trail head bus stop 大菩薩峠登山口 (30 mins, 300 yen) click here. If you plan on driving the options include either parking a 5 minutes’ drive up the hill from the Daibosatsu-toge bus stop or alternatively at Kamihikawa-toge 上日川峠. From the bus stop walk along the paved road until you reach the first car park. From here you can either turn left and head via the Marukawasou-sansou 丸川荘 or right as I did and pass via the Choubei Lodge ロッヂ長兵衛 which takes around 90 minutes. As the 09:30 bus from Eazan station was taking a grand total of four backpackers I was dumbstruck arriving at Kamihikawa-toge to find the place over run with hikers. The car park was packed to overflowing including several tour buses. After taking a short break and allowing another a large hiking troop to pass by I continued up to 福ちゃん荘 Fukuchan-sansou. While chatting with the friendly owner he mentioned that the nearby Fujimi-sansou 富士見山荘 had recently closed, though pointed out it had great views of Mt. Fuji. I decided to check out the hut for myself and found it’s surroundings made a good place for an early lunch. From the Fukuchan-sanso it takes around one hour of slogging to reach the Kaminari Iwa 雷岩 a prominent rock out crop with magnificent vistas. From here the backpack came off for the 10 minute detour to the summit of Mt. Daibosatsurei 大菩薩嶺 (2,056 m) which is shrouded in tree cover. Turning right at Kaminari Iwa you remain on the ridge for the next 45 minutes as you gradually head down passing an emergency hut and the Daibosatsu-toge literary monument before reaching the historical Daibosatsu-toge 大菩薩峠 (1,897 m) an important mountain pass between Tokyo and Yamanashi during the Edo Period. Daibosatsu-toge also famous from the novel The Sword of Doom by Kaizan Nakazato. Before heading off from the Kaizan-sansou 介山荘 I confirmed with the owner that the water hole at Furukonba フルコンバ was running which he assured me it was. The final leg to the make shift campsite at Furukonba takes around 40 minutes and upon arriving quickly found a level site to pitch the tent. Offloading the pack I went to work immediately to locate the water hole which was apparently only a minutes’ walk from the site. Unfortunately the owner neglected to point out that Bear Grylls determination was required to pinpoint it in the thick vegetation. Thankfully I was able to find it, though its small trickle meant a couple of minutes to fill up about one litres worth. The campsite being remote and desolate provided a wonderful contrast to the often noisy and regimented mountain huts I had been accustomed to. The next morning I woke up just in time to see the full moon disappearing behind the distant mountains. Apart from some deer rustling about near the tent I managed a comfortable night’s sleep. At around 06:30 I was surprised to see the first hiker of the morning who must have left the cark park at Kosugemura 小菅村 at some ungodly time. The day’s objective was to continue along the Tanba Daibosatsu-toge Bosatsudo 丹波大菩薩道 finishing in Tabayama Village 丹波山村. Given the uncertainty about available water sources I filled up my bottles as according to the map this was the last of them. After breaking camp I headed down to another saddle clearing at Nomedawa ノーメダワ which takes 50 minutes. It had a ambiance similar to my campsite though perhaps a little less suited to parking a tent. Between here and Oiwake 追分 I did in fact come across three streams but whether they run year round is another question. At Oiwake the trail splits in four directions with the more adventurous having the option of taking the mountain trail up to Sakariyama サカリ山. Deciding that time wasn’t exactly on my side I continued down to Fujidawa 藤ダワ (1 hour). This section of trail was particularly energising as you pass over a series of rough cladded bridges crisscrossing intersecting watercourses. Waiting for me at Fujidawa were several Japanese giant hornets (suzumebachi) so decided to postpone lunch until I reached the river. The final section to Tabayama is staked out with handrails and chains which work well until the land gives way making a couple of sections impassable without some tedious detouring. Due to the typhoon last week some portions of the trail had succumbed to fallen tress further hindering progress. The village of Tabayama is picturesque and would make for an ideal BBQ spot if it wasn’t for the fact it’s a good hours bus ride from Okutama Station. Note there are only four daily buses to Okutama Station click here. If you’re keen to lose the crowds from Mt. Daibosatsu I would recommend this overnight hike. Thanks, this was really helpful. I have to agree whole heartedly on the point about finding water at Furukonba. I was almost in a panic as i brought just enough and had to refill before moving on. No signs, area not visible from the trail and you cannot hear any trickle of water — it was like someone pulling a prank. Luckily, someone was kind enough to leave a plastic bag barely hanging on a tree and on a whim, decided to explore and was EVENTUALLY rewarded with water. From memory it’s pretty much just a goats trail and glad you were able to eventually pin it down. Some of those Yama-to-Kogen water markers are dubious and have given up in exasperation on a few occasions. Cheers for posting the GPS Coords.